CAPE CANAVERAL, Fla — Hawthorne, California-based Space Exploration Technologies, more commonly known as SpaceX, has released some impressive video during the company’s 13-year history. 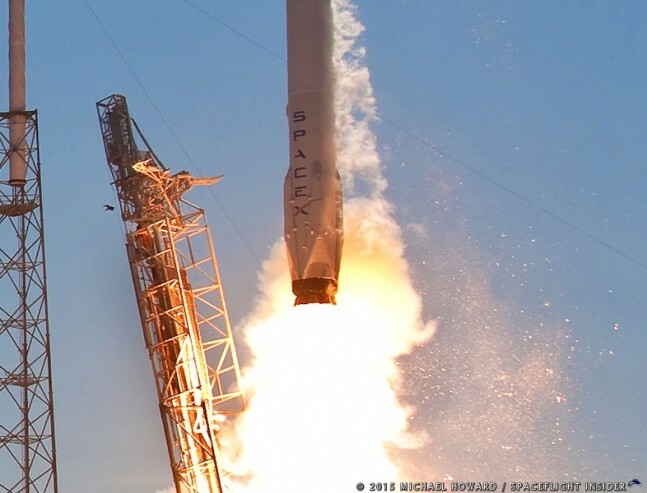 A recent one shows a Falcon 9 v1.1, having completed its primary mission of sending a Dragon spacecraft on its way to the International Space Station, attempting to land on a platform off the Florida Coast on April 14, 2015. The craft, dubbed the “Just Read The Instructions” Autonomous Spaceport Drone Ship by SpaceX’s CEO and Founder Elon Musk, helped to gather video from the attempt as well. In the video, the booster’s first stage can be see descending out of the sky toward the drone ship, its various thrusters and engines working to steer it to a landing on the floating platform. Just when it seems that all is well and the flight will enter the history books, it becomes obvious that the rocket’s first stage is leaning too far over, it drops, hitting the deck of the ship and explodes. One thing that the video makes clear is that SpaceX is gaining experience with each passing mission. During the January landing attempt, the first stage used section of the rocket struck the ship, careened over the side and exploded. This time, according to Musk, the rocket had too much “lateral thrust”, where the rocket’s momentum was too much for the thrusters to compensate for. The video below was constructed from side-by-side footage collected by a chase aircraft and from on board the “Just Read The Instructions” itself. I wonder if it could hover close to the deck until the fuel ran out. This would stop it exploding if it fell over, and a dry rocket would be easier to handle. This looks to be the last crash of a returning first stage Falcon. It came in fast but with phenomenal agility. Can’t say I’ve see a rocket ever dance like that. But the facts remain, it hit the target and didn’t crumple. SpaceX is technically agile too and will terminate main engines on touch down of a single leg. The thrusters lost this battle only because they were fighting the (still running) main engines which worked to tip it over. Very few outside of SpaceX realize exactly how close they really are. I wonder if they could engineer it to land horizontal. That would give it greater landing surface and stability. As Elon said it does seem to have a delayed reaction to what is happening but there seemed to be a lot of ocean occurring as the rocket thrust swept by could the thrust be responsible for pushing the barge aside as the rocket was about to land causing the lateral movement that tipped over the rocket? Would landing on land as SpaceX`s president said, be the solution? Blue Origin would be taking close note of how SpaceX has been faring with ocean landings. The two main problems as they would be seeing is the destabilising effect from the relative lightness of the landing barge and the damage done to its deck by the “blast torch” action from the descent engine. Jeff, this is how you fix both. Get yourself a big bulk ore carrier, say around 100,000 tons. Line the hold with a ceramic material that can absorb the focused heat from the descent engine without fracturing. Have a clamping mechanism on the four corners of the hold at deck level so that, when the stage has landed inside the hold, they will immediately close upon the stage to stabilise the stage in the vertical position. I am sure that if SpaceX wanted to land at sea this is what they would eventually end up doing.